Great day, and I even got a little suntan! more from the East Bay! Here's more sketchcrawl from me!!! wow... u guys have a big group! 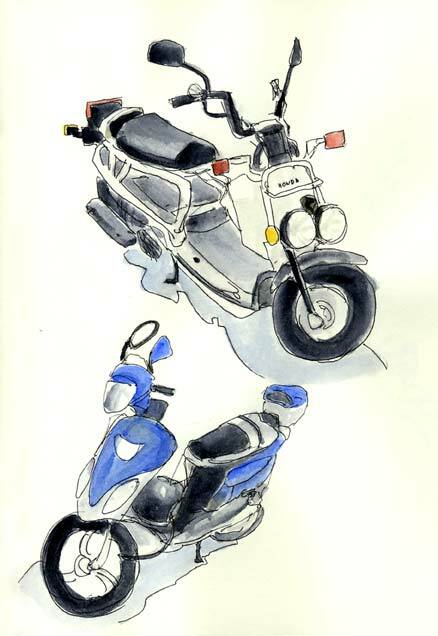 Lots of beautiful sketches from East BAy! There's a bunch more posted from the Berkeley crawl on my blog...sorry for having to link out! Because one of my friends was late, my mini group deviated a bit from the main group on campus. We did sneak into a baseball game though! Scooters/bikes parked alongside the campus. Can anyone identify the last two for me? I thought it was strange that they added the eye to the pterodactyl, so I didn't include it. awesome sketches everyone! 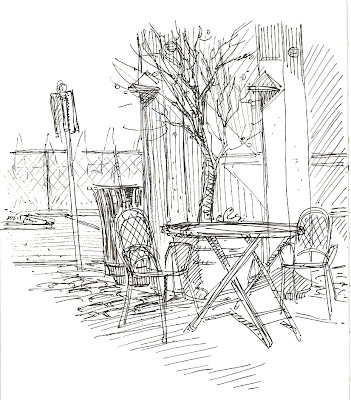 The landscape sketches evoke a really nice atmosphere! I'm really impressed by your thumbnail studies of people, karen, the scrible style adds a lot of nice to them. Dang! There are so many nice sketches from the last SC! I'm bummed that I wasn't able to participate this time. 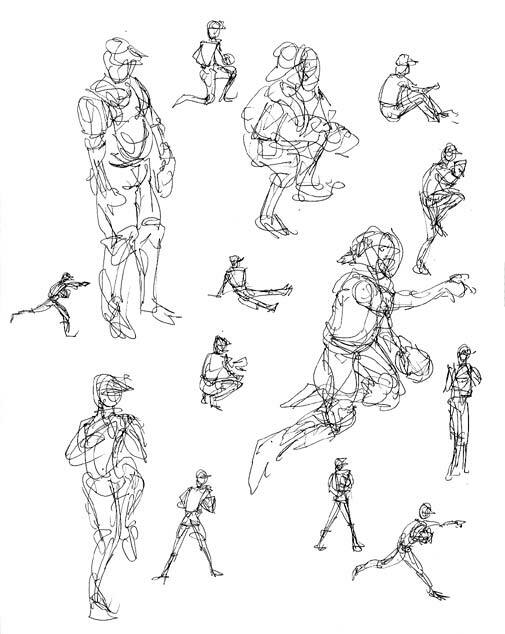 Karen - Fantastic action gesture drawings of baseball players! The scooters almost look like they could be characters (like the cars in "Cars"). Not many people did head studies this time around so it was good to see that you did some! 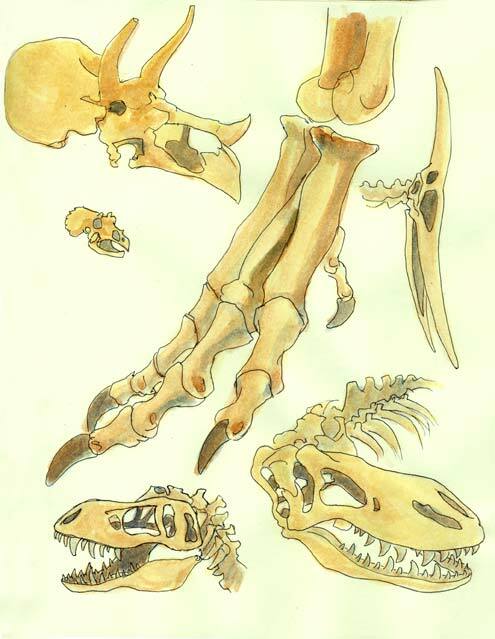 I like the simple lines and your color choices in your dinosaur bone drawings. 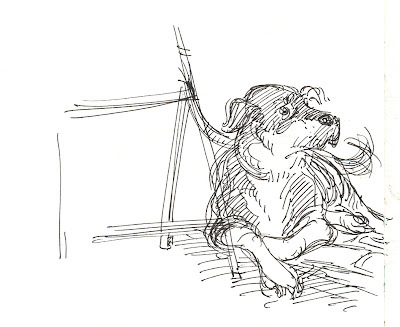 Chris Chue - The quick sketch of the dog is great. The loose lines make it look like he's wagging his tail. Splinesmith - You did so many drawings that I don't know where to begin. Your T-Rex drawing people is funny and really imaginative. So is the one of the two pterodactyls complaining about having a big head. 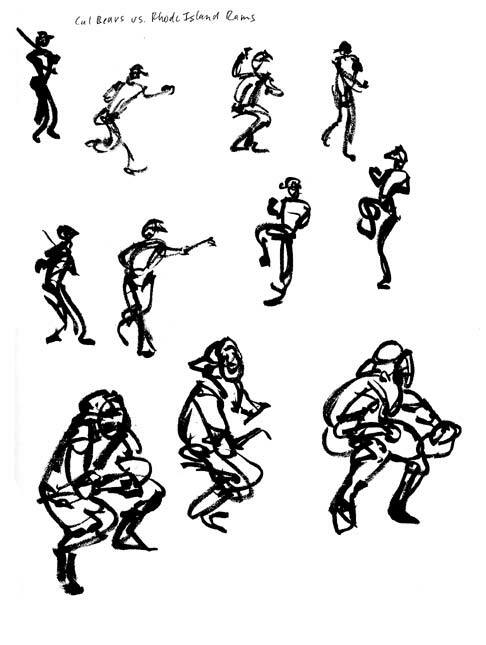 Great thumbnails of people in action! 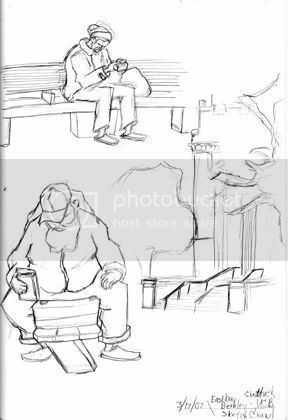 I like the 2 drawings of guys chillin' in front of their stands, surrounded by their ware. Scott Morse - The low perspective is interesting in your drawing looking up at the people. Nice use of loose lines and watercolor in all of your pieces. Gary - Dramatic angle looking down on the T-Rex. I like the shading on the bust (The OTHER kind of bust you guys! Jeez!). Hoffman - It's interesting that you chose to draw the newt and frog in jars. It's a pretty weird and unique subject that you don't see in drawings every day. Chris Chua - Your drawing of a guy ordering coffee is interesting because it's of a person communicating with someone else. Martha - I like the foliage that you added to your architecture drawings. Plants really help to soften the hard lines of buildings. The details that you added in the walls gives them some texture. Also, good job on the pterodactyl. 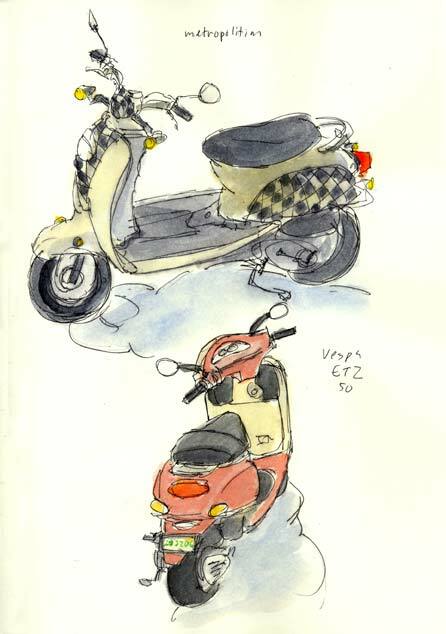 Pete - Awesome sketches! I also love the Brazil Cafe because it captures the Berkeley atmosphere. Your drawings would make really nice postcards. 2dAnimator - I love the way you drew the Welman Hall building in a cartoony style by bending the building and ground, and by using fun colors. Rebecca - You did a lot of drawing! South Hall turned out great. I like how the decorative grate on top, the steps at the bottom and the trees at the left and right frames the building. Your Pterodactyl and T-Rex skull are great. 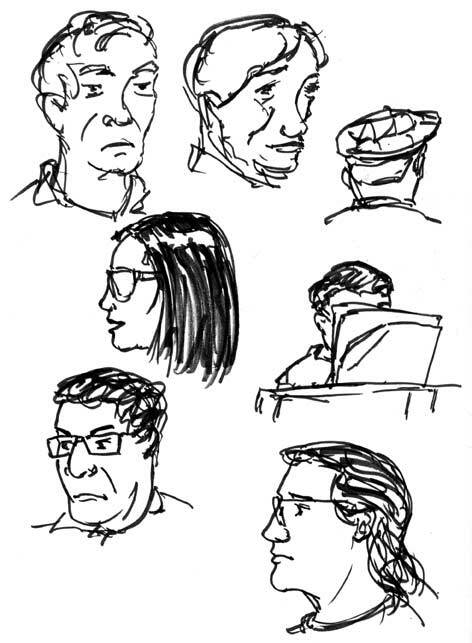 I also like the sketch of people in a cafe. Oliver - Your sketchbook page composition is really interesting. Your eyes get pulled down the page to the bottom right corner where there's a bunch of squirrels hanging out. Cool!